(1920 - 1974) In 1920, W. C. Hundley became our pastor. Apparently, no church letter was sent to the association during the years 1921 through 1923. Therefore, we cannot definitely state that Bro. Hundley was pastor during this time. He does appear on the record again in 1924 as our pastor. He remained pastor until 1928. C. L. Harmon is given as pastor from 1928 until 1929. Then W. C. Hundley is given as pastor again and he remained until 1932. It was under the ministry of W. C. Hundley that J. C. Raikes was licensed to preach the gospel, however, Bro. Raikes was ordained while Rev. Crit Harmon was pastor. In 1932, L. E. Whitlow became the pastor. One of the greatest blessings the historical Committee received while working on this report was in visiting Rev. L. E. Whitlow at a Presbyterian Home for the aged at Beuchel, Ky. Although 94 years of age, he remembered vividly his years at Muldraugh Hill. He recalled each evangelist who served with him during revival periods. He laughingly remembered how he was showered for his efforts in the revivals with coops of chickens, half bushels of sweet potatoes (minus 2 lbs. ), etc. Bro. Whitlow told of one deacon (Bro. Farmer) who gave him half a bushel of sweet potatoes, because he didn't want to overload his car, and promised the other half bushel later. The following year when they were again in a revival, Bro. Whitlow and the evangelist visited the home of this deacon. During their visit the evangelist expressed the feeling that the revival was not progressing as it should and wondered why. Whereupon, Bro. Whitlow jokingly replied he knew the reason why. Bro. Farmer had promised him a bushel of sweet potatoes a year ago, but had only given him a half bushel and it lacked two pounds being a half bushel. After an establishment had been built near the church door for the sale of alcoholic beverages, the church, through Bro. Whitlow's leadership, petitioned it out. He remembered and mentioned many of the members in the six years of his ministry here. While preaching for us the second and fourth Sundays, he was also pastor of Palestine Church, preaching there the first and third Sundays of each month. He made his home at Campbellsville, Ky. Total membership as shown on the new register June 24, 1938 was 326. Bro. Whitlow sent this reply to the church shortly after receiving an offering from us: November 7, 1957 Dear Members: I was surprised, and greatly humbled to receive such a generous love gift from you. It sent many precious memories rushing through my mind back to the time when you honored me with the privilege of serving as your pastor. "Brethren" I haven't the words with which to express my gratitude to you for this remembrance. Mrs. Whitlow joins me when I say, "Thank you. We covet your prayers." Your true friend, Rev. & Mrs. L.E. Whitlow For the next 14 months, beginning October, 1938, Rev. E. M. Gash served as pastor. Little is known about Bro. Gash other than he had a son who also was a preacher. Rev. G. E. Puckett succeeded E. M. Gash in January, 1940. Several improvements were made on the grounds and buildings under his ministry. These general improvements consisted of papering, painting, replacing the roof on the church, two new doors, two new stoves, 100 hymnals, new flooring, and benches, as well as cleaning of grounds and cemetery. In 1942, the church purchased twelve Sunday School books to send to our men in the service and Mrs. J. P. Wade was authorized to make a service flag in their honor. Within the past decade a "carbide light plant" had been installed which was somewhat an improvement over the "coal oil lamps", but an even greater improvement was made when R.E.A. lights were installed in December, 1940. Disposing of the "carbide light plant" posed to be a problem for an entire year. The plant was advertised in both Marion and Taylor County papers which resulted in no sale. Omer Caulk was granted the right to sell the complete light plant at a price not under $75.00. When he was unable to dispose of it at this price, an offer was made to trade a horse on the "plant." Motion and second was made for Bro. G. A. Sapp and Mance Moore to appraise the horse, which evidently was an unsatisfactory trade. The church lowered its selling price to $60.00 and later to $50.00. Finally in desperation the church offered the plant for sale at public auction to members of the church. Minutes of December 28, 1941 record the sale of the entire plant and building for $71.25. Bro. Puckett served Stewarts Creek Church in Marion County as well as Muldraugh Hill during 1940-1942 and resigned September 10, 1944 to accept the First Baptist Church at Jeffersontown. October 15, 1944, the church called John T. Pierce as pastor for an indefinite period of time instead of yearly. At this time the church voted to go to full time preaching and weekly Wednesday night prayer meetings as soon as Bro. Pierce came on the field. Since he was the first full-time pastor, the church felt a need for a pastorium. 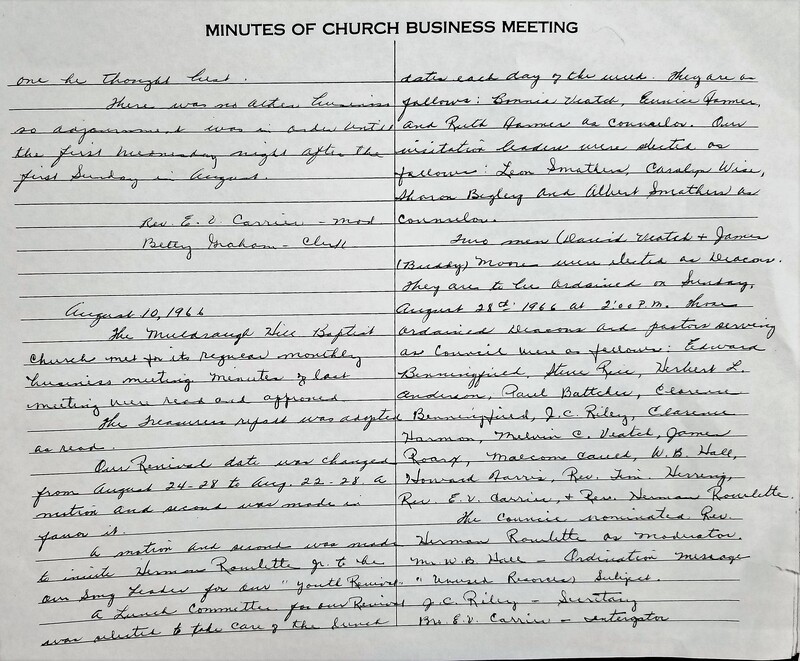 The property adjoining the church was purchased from Mr. and Mrs. Robert Maupin for the sum of $2850.00 in 1945 and was debt free by February, 1947. In a business session October 28, 1945, motion was made and seconded for the church to send a letter to the President, Representatives, and Senators to ask them to forbid alcohol of any kind to be in and around the military camps where our boys are in training. The Rev. Sam Morris of Houston, Texas, well known temperance speaker, who once spoke here, was sent a love offering of money periodically. Our first Bible School was held in 1946 and has continued each year. In the same year, because of immoral practices on the church property, a fence of posts and cable were erected. Also, the monthly business meeting was changed from Sunday to Wednesday night. 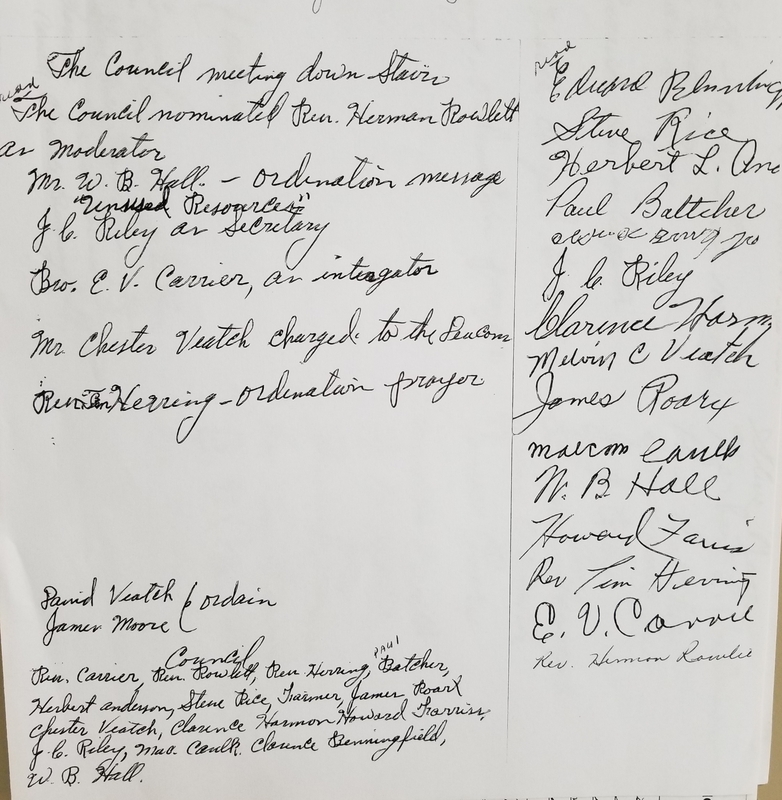 The next year, in order to have a more unified worship service and a better informed congregation, a bulletin service was established, however, upon the resignation of pastor, bulletins were discontinued until 1954. Having resigned as pastor of the church, Bro. and Mrs. Pierce called for their letters to unite with the Burton Memorial Baptist Church of Bowling Green, Ky., March 27, 1947. He is most remembered for his firm stand on the use of tobacco, alcohol and catholicism. Muldraugh Hill Baptist Church met on August 31, 1947 for the purpose of calling a pastor. Rev. John M. Wall was nominated and called with a unanimous vote. The church once again was extending a yearly call to her pastor. Shortly after his arrival on the field, a committee was appointed to make arrangements to start a Training Union Program which was finalized January 25, 1948 with Paul Payne as director and an enrollment of 123. The church increased its outreach by sponsoring a Radio Program each Sunday morning over W.T.C.O. in Campbellsville, Ky. Porter Benningfield, Howard Farris, Donald Moore, Robert Farmer, Harold Cox, Chester Payne, Mrs. Mary Parrott, Bertha Yates, Mrs. Lottie Moore, Dorothy Jean Farris, Pauline Bohannon, Delores Rice, Betty Yates, Joyce Maupin, Elizabeth Parrott (pianist), Lorene Hardesty, Lester Farmer, Emogene Brockman, Janet Farmer, James Robert Moore, Mrs. Ada Sapp, and Mrs. Irene Maupin composed the radio choir. The radio program was discontinued with the resignation of Bro. Beard. A much needed improvement of our church building at this time was Sunday School rooms. We only had curtains to divide the groups and it made it very unsatisfactory to teach and listen. Prior to this time, pastors had talked of the need for these facilities, but the church felt unable financially to build. With the leadership of Bro. Wall, interest was increased and the rooms were completed by September, 1948. The men of the church honored Bro. Wall with a new car during his ministry here. April 2, 1950, Bro. John W. Wall announced his resignation as pastor of Muldraugh Hill Baptist Church to become effective about the first or second Sunday in May. Our eighteenth pastor was William R. Beard who came on the field in June of 1950. Soon after becoming our pastor he married Frances Niceley. Their oldest daughter was born while they served here. Worship services and prayer meetings were well attended and the Sunday School broke all previous records with an attendance of 376 on a homecoming day. During seasons of revival the church would often be filled to capacity with people sitting in the aisles and around the platform of the pulpit. Bro. Beard was instrumental in starting a building fund for the Present house of worship and at the time the building was started, there was $10,000.00 in the building fund. Rev. Beard made known his resignation January 24, 1954 to become pastor of Mackville Baptist Church in Washington County. 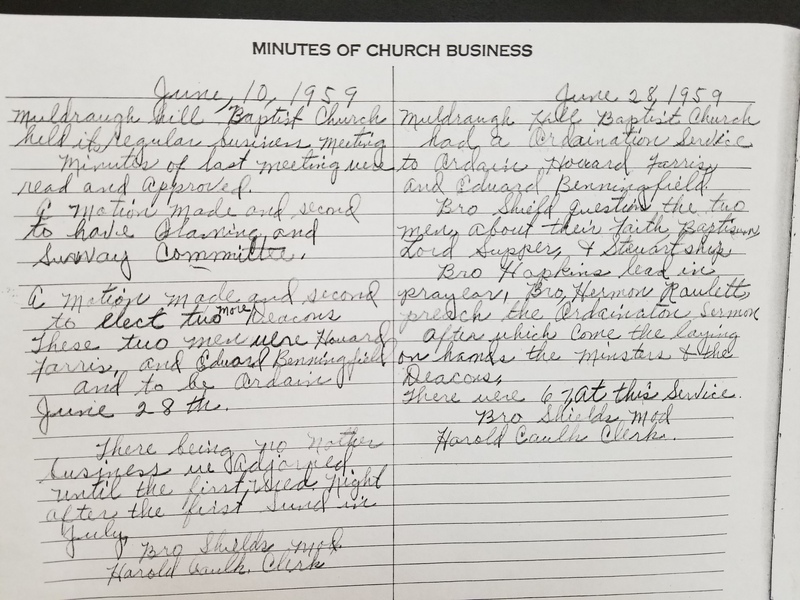 On January 23, 1954 the “Minutes of Church Business” record reports that Muldraugh Hill Baptist Church held a special business meetting after the Evening Worship Service for the purpose of electing a pulpit committee. The following men were voted to make up the committee: Rodger Smith, John Taylor, Leroy Feather, Steve Rice, and Chester Veatch. John Taylor was eleted chairman of the pulpit committee. See other details. Bro. W. R. Cook succeeded Bro. Beard as pastor and was called March 17, 1954, from Younger's Creek Baptist Church in Hardin County. Bro. Cook's stay at Muldraugh Hill was brief, lasting only 10 months, and during his pastorate a budget system was first set up in September, 1954. Following Bro. Cook was Rev. Kit C. Yeaste in August, 1955. In the spring of 1947, a Woman's Missionary Society was organized with an enrollment of 14 and Mrs. Bertha Yates as President. Again the W.M.S. was reorganized on September 9, 1957 under the leadership of Mrs. Sara Yeaste. with 22 members. Mrs. A. B. Colvin helped organize and presided at this meeting. Officers elected were: Mrs. Virgie Smith, President; Mrs. Bertha Yates, First Vice President; Mrs. Mary C. Begley, Second Vice President and Program Chairman; Mrs. Esther Veatch, Community Missions; Mrs. Sara Yeaste, Missions Study Chairman; and Mrs. Louise Bright, Secretary-Treasurer. Several auxillaries have since been added: Y.W.A (Mrs. Richard Shields) in March 4, 1959; and G.A. 's (Mrs. Betty Meers) in Jan., 1962. On September 29, 1974, Carolyn Porter and Tammy Settles received the adventure 3, which is equivalent of princess in the forward steps program. Sunbeams (Mary Frances Veatch and Marie Caulk) was organized in Jan., 1962. Bro. Yeaste seemed to have been interested in organizing a Brotherhood, but this wasn't realized until 1962 with Steve Rice as President and Clarence Yates, Secretary-Treasurer. The Pioneers of the Royal Ambassadors was organized on Wednesday night, February 28, 1962 at Muldraugh Hill Baptist Church. David Veatch was the leader with the following 8 members: Sammie Farris, Mike Farris, Danny Farmer, Lonnie Moore, Dennis Allen, Jerry Smothers, Leon Smothers, and Ricky Yates. During these years, under the leadership of Bro. Yeaste, the people were made aware of needy people in the community. Financial aid was given to a former pastor, (Bro. Whitlow), a free will offering was taken for a man with a terminal illness, and shoes were bought for a needy family. This has been a policy of the church as far back as records exist. After the morning worship service of December 19, 1957, Bro. Yeaste resigned to accept a pastorate at Stanford, Ky. Rev. Richard M. Shields assumed his duties as pastor, March 19, 1958. On October 4, 1958, a wet--dry election was the subject of much controversy in Marion County. In a bulletin dated July 6, 1958, Bro. Shields stated: "Our church will be involved in a great way in the very near future, as the time arrives for the local option election in the city and county. I trust that you will make your stand for the cause of the right as you sign the petition to vote dry. You will speak louder than you have had the opportunity to speak for a long time and maybe even for a longer period of time." Rallies were held at this church and throughout the county to boost support for the dry cause. The opposition, however, was just as determined and came out victorious in the campaign. On February 4, 1959, a telephone was installed. In order to enable more people to attend the worship services, the church purchased a bus in May, 1959 for the sum of $175.00. The bus proved very useful during Vacation Bible School. This service continued for almost two years, when, because of the expense involved in upkeep, the church felt best to sell it. Money derived from the sale of the bus was used to buy a used piano for the basement. On May 12, 1959, a motion and second was made to go on record to build. However, prior to this time, funds had been set aside with building in mind. A survey of the membership was made in order to determine who really wanted a new house of worship and would be willing to support it financially. A building plan was adopted similar to that of Bullitt Lick Baptist Church of Shepherdsville, Ky.. At first, a basement was not included in the plans, but was added later. The colonial style, brick sanctuary with basement and education facilities was to cost approximately $55,000.00. On June 10, 1959, during the Monthly Business Meeting, Howard Farris and Edward “Boss” Benningfield were nominated to serve as deacons. Upon their approval, a date was set for their ordination. They were ordained by Bro. Richard Shields on June 28, 1959. See further details. In a business meeting of May, 1960, a motion was made to begin building as soon as contractors and materials could be secured. Serving as a building committee were: Carl Farmer, Leslie Brockman, Edward Benningfield, John Taylor and Bro. Shields. In August, 1960, Muldraugh Hill Baptist Church broke ground for the erection of a new building. The oldest member, Mrs. Virgie Thompson, and youngest member, Estelle Veatch (Brady), helped Bro. Shields with the first shovel of dirt. Money in the building fund was soon exhausted, and until a loan could be secured, Mr. Frank Caulk came to our assistance with a loan of $10,000.00. Later, $25,000.00 was secured from the Taylor County Federal Savings and Loan Association to complete the construction of the building and to repay Mr. Caulk. Within a year, the building was completed. On Christmas Day of 1960 following the morning worship service, Bro. Richard Shields resigned as pastor to be effective January 15, 1961. A Pulpit Committee was formed January 1, 1961. Two months after Bro. Shields' resignation, on March 19, 1961, Harold G. Meers of Knox Creek Baptist Church was called as pastor. He moved to Lebanon April 13, 1961. A typewriter and filing cabinets were purchased May 10, 1961. The church building had not been completed when Bro. Meers became our pastor. Within a few months, however, the building was ready for use. Dedication services were held on July 16, 1961. The dedication message was by J. Chester Badgett of the Campbellsville Baptist Church. The dedication prayer was led by the pastor and the hymn, "Bless This House," was sung. The responsive reading of the dedication was as follows: Pastor: In recognition of our dependence upon and as an expression of our love for God the Father, the Son and the Holy Spirit, we the pastor and members of the Muldraugh Hill Baptist Church, here assembled on the 16th day of July, 1961 People:Acknowledge with gratitude, that is from the heart, Thy divine blessings and unerring leadership through the years. Pastor: To the glory of God by whose favor these blessings have come to us; to the honor of Jesus, the Son of the living God, our Lord, and Saviour; to the praise of the Holy Spirit, source of light and life: People: We do with joy and gratitude solemnly dedicate this building. Pastor and People: We now, the people of this church dedicate this church together with all material, equipment and ourselves. We are Thine, use us and the church according to Thy Holy purpose, for Thine Own Glory. Amen. Several improvements have been added in the years since. The public address system was installed July 17, 1968, a lighted outdoor bulletin board, walks and curbing, shrubbery, steeple, and other small items such as Baptist hymnals, chairs, cabinets, etc. On November 8, 1961, by recommendation of the deacons, the church adopted the family night plan for the various mission organizations. Family Night was to be held on the fourth Wednesday night of each month and continues to meet at that time until this day. Robert Smothers was ordained as deacon on April 4, 1962. The New Market Presbyterian Church property was purchased by the church in the fall of 1962 for a sum of $400.00. The ground was to be used as a free cemetery and the trustees were to dispose of the old church building in the most profitable manner. The church building was sold to Charles Wright for $125.00 and the piano to Howard Farris for $15.25. The church assumes the responsibility of the upkeep of three cemeteries. Included in these is the cemetery across the highway which was given by a Mr. Sapp to be used as a community cemetery, and the cemetery at the site of the former New Market Baptist Church. Following is a letter of resignation from Rev. Harold G. Meers on January 29, 1963: To My Dear Friends in Christ, of the Muldraugh Hill Baptist Church: It is apparent to me that God wills that I go to become pastor of the Highland Park First Baptist Church of Louisville, Ky. It is for this reason that I am resigning as pastor of this church. My last Sunday with you will be February 10, 1963., Our time together has been short, but it has been most rewarding for the cause of Christ. Let me make it clear, I am not leaving because any-thing is wrong here, rather, it is because most things are in good order. The reason for leaving is the call to fill the great need of the Highland Park First Church. My heart is near many of you and this place. It is not easy to leave those we love. It is not ours alone to choose, for when God calls, His ministers must follow. I am as concerned for your welfare today as I was the day I began to work with you. My prayer is that God will lead you to a wise and able pastor. Yours in Christ, Harold G. Meers A vote taken on March 31, 1963 resulted in the call of E. V. Carrier as pastor. Bro. Carrier was instrumental in helping to retire our church indebtedness. Most of the White Christmas offering, which has been a tradition for several years, was used for this purpose. A bulletin dated March 13, 1966 states: Taylor County Loan was paid $3,195.00 on the building debt.  This brought the debt down to $15,032.42. As recorded in the minutes of the August 10, 1966 Business Meeting, David Veatch and James “Buddy” Moore were elected as deacons and “are to be ordained on Sunday, August 28, 1966 at 2:00 p.m. Those ordained deacons and pastors serving as council were as follows: Edward Benningfield, Steve Rice, Herbert L. Anderson, Paul Battcher, Clarence Benningfield, J. C. Riley, Clarence Harmon, Melvin C. Veatch, James Roarx, Malcolm Caulk, W. B. Hall, Howard Farris, Rev. Tim Herring, Rev. E. V. Carrier, and Rev. Herman Rowlette. The ordination was performed by Bro. E. V. Carrier. See further details. In a bulletin dated September 22, 1968, Bro. Carrier stated: "At the beginning of this last year, as your pastor, I said in a prayer meeting, 'If this church will support missions around the World by giving as much as 10% of our income to mission causes, God will give us a great year.'" This He has done, our receipts this year has gone beyond the $20,000.00 and our gift to missions has been the largest in the history of the church. We now owe the Taylor County Loan Company approximately $2,600.00. If our offerings keep pace with the past, we are planning to have a "note burning" service on December 15, 1968. A note burning service was held at Muldraugh Hill Baptist Church, Sunday morning, November 24, 1968, after paying the church debt. In seven years, the church was able to pay a $22,000.00 note plus interest. The church trustees had negotiated seven years ago with the Taylor County First Federal Savings and Loan Association of Campbellsville for a $22,000.00 note that was to be paid within 14 years. "Since the building of the church, the budget has steadily grown until now the budget has reached the $20,000 a year outlay for local and mission work," said the Rev. E. V. Carrier, who recently resigned his pastorate at the church. November 24, 1968 was the last Sunday of the pastorate for Bro. Carrier, who now is pastor of the Immanuel Baptist Church in Elizabethtown, Kentucky. L. D. Kennedy of Campbellsville College served as interim pastor three months before our present pastor, Rev. R. B. Hullette came on the field, March 7, 1969. 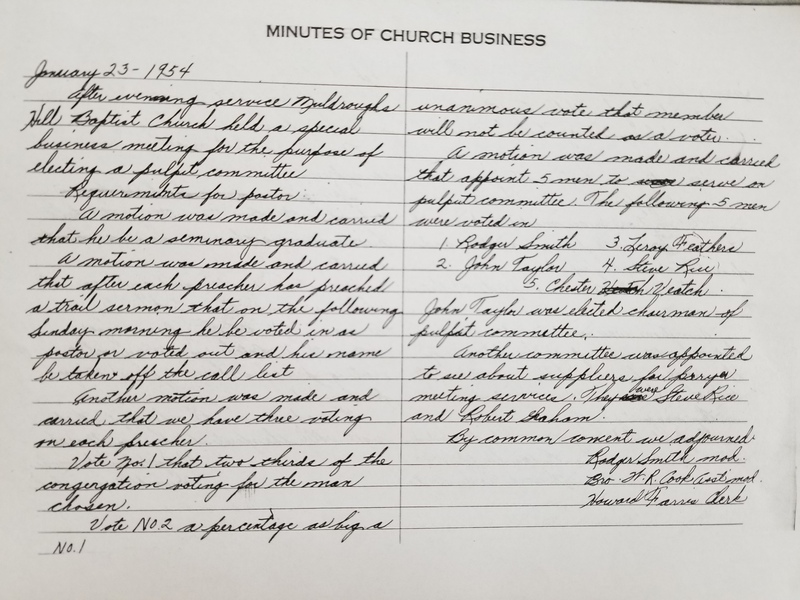 The church in a called business session, August 24, 1969, on a Sunday morning, voted by a 64 standing vote and none in opposition to proceed with breaking ground for a new pastorium. The planning and building committee consisted of Lester Farmer, Raymond England, Edward Benningfield, Sarah Brockman, and Betty Graham. On October 14, 1969 the contract was let to G. W. Barnes, Campbellsville, Kentucky. Work began October 18th on the excavation of the basement. The new home (28 feet 8 inches x 74 feet, 8 inches) consists of a full size walk-out basement, two car garage, den, kitchen, dining room, living room, three bedrooms (one with adjoining bath) and a central bath facility. The cost was to be around $25,000. Harry B. Thompson was the architect and upon completion of the pastorium, the Hullette family moved October 5, 1970. The former pastorium which stood near the front of the present one was purchased by Lambert Livers March 21, 1970 at a cost of $725.00. The building was moved intact to Mr. Livers' property which adjoins the church property. Plans were discussed at length at a June, 1973 business meeting for replacing the steeple which had been destroyed by wind May 23rd of the same year. The steeple decided on at this meeting was one with a cross on top and one from which the bell of the former church building could be installed. This bell was purchased and erected for the first time in 1925 by Mr. James Farmer. The present steeple was erected October 1, 1973 by Aluminum Manufacturing Company of Greensburg, Kentucky costing $3500.00 of which $1131.06 was derived from insurance. The church being without a song leader, after Jerry Smothers, who held this position, moved, felt someone outside the church could better fill this vacancy. David Forman of Campbellsville, Kentucky was elected and presently fills this position. Until 1930, a pump organ was used to accompany the congregational singing. This was the first mention of a piano in the records. In the years following, the church brought a new piano and electric organ which are in use today. The church history includes documentation of the Church Membership and Sunday School Enrollment from 1875 to 1973. The Church History also includes the Women's Missionary Union Presidents and Brotherhood Presidents from 1957 to 1973.